I love making care packages. Two of the reasons I run two (soon to be three) online shops is because I love sending pretty out into the world and I adore my friends at the post office. We drive ten miles out of our way to go to the post office we like. The post office that is two miles away from us is awful. Both Daniel and I would rather have a pleasant experience with dear postal friends then leave feeling like deflated anger balls. Today, dear friends, is our day to finish packing up orders, Christmas packages and many many letters. I am going to feel so much better when I go to see my post office friends and send all sorts of pretty out into our world. I hope you have pleasant postal experiences this week. You deserve to leave feeling like a pretty princess after putting all that love and work into your mail. p.s. I'm getting my hair done today and I am so excited! 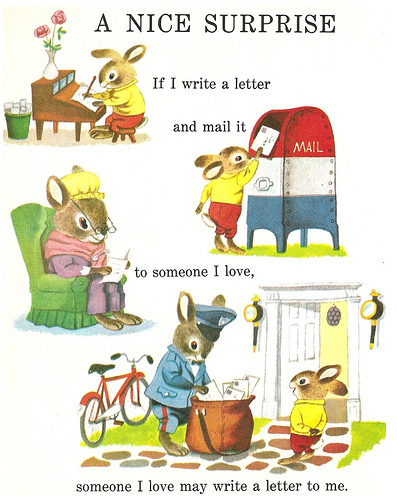 Richard Scarry is right, reminds me of my childhood. LuLu is SO into Richard Scarry right now - I love it! I am at the post office almost every day with my business...thank goodness I like mine. Can't imagine driving so far but I can see the reason why. Cranky po workers and a yucky building aren't very fun.